This groundbreaking exhibition traces the early thread of 19th century Jewish immigrants seeking success in America interlaced with one hundred years of fashion from 1860-1960. 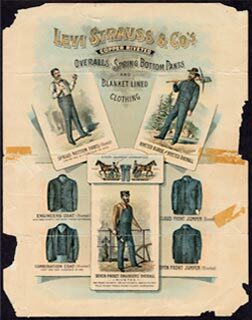 From 19th century Levi’s jeans to evening gowns and early sewing machines, A Perfect Fit presents over 100 historic costumes with archival documents, advertising, industrial equipment and multi-media installations, providing an engaging exploration of a topic that blends fashion, history and culture. The very fabric of American culture cannot be fully understood without an appreciation of the role that the garment industry has played in our history. To understand the schmatte business or rag trade, as it is playfully called, one must realize the role American Jews have played in designing, altering and literally stitching together the whole business. From the early threads of 19th century immigrants seeking success in American, to tailors and peddlers, pressers and cutters, designers and manufacturers, models and moguls, A Perfect Fit showcases the impact and influence of American Jewry on the world of fashion. Well-earned homage is paid to stellar household names, and also to the masses of skilled, hard working immigrants who plied their trade in virtual anonymity. Together they fashioned an industry that helped propel the American economy as it launched the livelihood of tens of thousands of American Jews. Designated a National Endowment for the Humanities “We The People” initiative for promoting knowledge and understanding of American history and culture, this exhibition and related programming explore all aspects of this fascinating topic. This exhibition has been organized by Yeshiva University Museum. Lead sponsorship provided by Halina and Samson Bitensky. Major support provided by The Coby Foundation, Ltd., New York, Anonymous, Levi Strauss Foundation, Fritz and Adelaide Kauffmann Foundation, The David Berg Foundation, and Robert and Tracey Pruzan. The exhibition is further made possible by Lynn and Sy Syms, Laura and John Pomerantz, Nina Footwear, Jones Apparel Group, The Slovin Family, Ruth and Theodore N. Mirvis, Bernard and Barbara Groveman, Simona and Jerome A. Chazen, Andrew Rosen, Howard and Andrew Kahn, and Kathryn and Alan C. Greenberg. Addition support provided by Bloomingdale’s, Bergdorf Goodman, Hartmarx Corporation, Daffy’s, Brookwood Companies, Inc., Forward, and by public funds from the Institute of Museum and Library Services, the NYC Department of Cultural Affairs, and the New York State Council on the Arts.